A stunning gold chart: Where will new supply come from? A shocking gold-stock chart: Is the bottom near? Crude slammed… Betamax, RIP… Jim Rickards’ No. 1 private deal recommendation… and more! “Any way you look at it, the long-term forecast for gold is up,” says Byron King. We don’t talk about gold as much as we used to here in The 5 — mostly because there’s not much to say. We talked about gold a lot on the way up to $1,900 in 2011. We repeatedly passed along Greg Guenthner’s warnings about a new bear market — starting from the $1,650 level in early 2013. For the last year, gold’s been range-bound between $1,080-1,300. Snooze. At the same time, we notice the number of people who open this daily email spikes a bit when the word “gold” is in the subject line. As it happens, two of our editors are back from recent conferences where gold was a hot topic, if not the hot topic. “Let’s first look at gold from the supply side,” says Byron. He attended the legendary New Orleans Investment Conference, founded by the late Jim Blanchard — the fellow whose efforts prodded Washington to make gold ownership for U.S. citizens legal again in 1974. 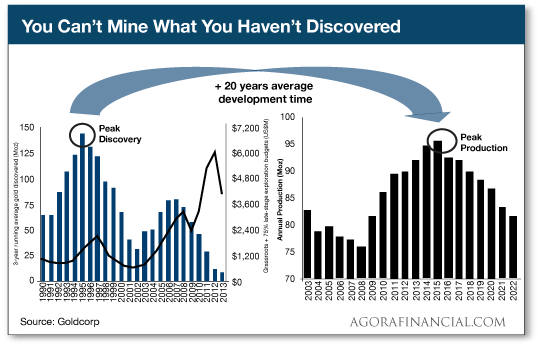 “Several New Orleans speakers made the obvious point that you can’t mine what you don’t discover, and gold discoveries have all but fallen off a cliff in recent years. The last of the world’s great, massive gold discoveries were in the 1980s, with some ‘not bad’ years in the mid-2000s. Yet it takes about 20 years to go from discovery to actual production. And then there’s the “missing” gold supply from China. Jim Rickards also spoke in New Orleans and hit on that very point. “In essence,” Byron paraphrases, “China does not export gold, and also imports plenty. “China has gold mines, of course; it’s a big country with natural resources. Chinese miners mine gold, to be sure. But at the end of the day, Chinese net gold exports are zero. “Meanwhile, Chinese gold imports are large and widespread. The Chinese government buys gold, as does Chinese industry. Chinese consumers buy gold too, at the retail level. Gold imports flow to China from the U.S., Europe, Australia, Africa and more — to include China’s Hong Kong portal. And then there are the gold stocks. Over the long sweep of the past decade, gold has doubled in price. Gold stocks as a group have been cut in half. Our investment director, Chris Mayer, just back from the Grant’s Fall Investment Conference in New York, heard a thoughtful presentation from John Hathaway, manager of the Tocqueville Gold Fund (TGLDX). Hathaway’s performance has spanked the gold stock indexes. But even the most skilled manager of a gold stock fund can’t escape the carnage in the sector. Shareholders of the fund are down an annualized 20% the last five years. “So Hathaway showed, in a way I’m sure he’d rather not repeat, his stock picking chops,” says Chris. Let’s summarize. 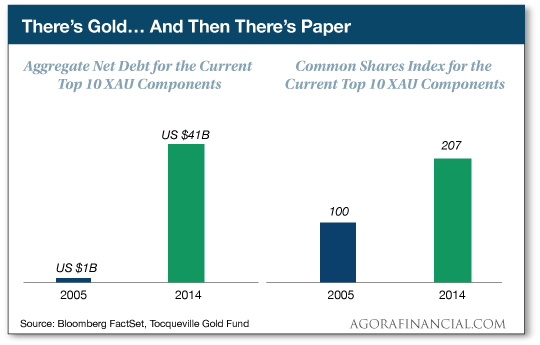 Among the top 10 stocks in the XAU index of gold miners, their debt multiplied 41 times in 10 years… and the number of common shares outstanding more than doubled. But wait, there’s more: All this took place while their gold production grew only 13%… and gold production per share fell 45%. But — “We’re also close to an important inflection point with gold,” Chris says. “For the first time in years, many gold stocks are cheaper than the cost to rebuild (or replace) assets. “Replacement value is a good anchor to windward. If you consistently buy good assets below replacement cost, odds are good you won’t lose money. [Ed. note: Jim Rickards’ next book, The New Case for Gold, is set for publication April 5, 2016, by Penguin Group’s “Portfolio” imprint. Gold is treading water as we turn our gaze to some thinly traded markets on this Veterans Day. Once again, it tried to make a run toward $1,100 overnight — only to retreat to $1,087 as we write. The major U.S. stock indexes are in the red, but not much. The S&P rests at 2,078. The 10-year Treasury yields 2.34%. The dollar has weakened a bit in the last 24 hours. Crude is the big mover, even though the Energy Department isn’t releasing its weekly Wednesday inventory report till tomorrow, because of the federal holiday. At last check, a barrel of West Texas Intermediate is hanging onto the $43 level by a rapidly fraying thread. It was a high-risk, high-reward opportunity — and it didn’t work out. Hardly. The steak was all there. Still is. The opportunity was thoroughly researched — else we wouldn’t have played it up as much as we did. But we’ll be the first to concede it didn’t work out as planned. So what happened? “We saw fantastic Phase 2a data from our Alzheimer’s pick when researchers presented data at the Clinical Trials on Alzheimer’s Disease conference in Barcelona this weekend,” says FDA Trader editor Ray Blanco. Because the study’s focus was on safety, one group of patients got the drug via IV for 12 days, went off the drug for 12 days and then got the drug via oral dosing for 12 days. For another group of patients, the process was reversed. Alas, “the company has come under a sharp attack,” says Ray, “by unscrupulous individuals using ‘short and distort’ tactics. One article that got much circulation on the Web — we won’t cite the source lest we give it any credibility — labeled the study’s results “meaningless” because none of the patients was given a placebo. “Early-stage trials generally do not have placebo controls in place,” Ray explains. “Early-stage trials are conducted to evaluate safety, and any efficacy data are essentially of an exploratory nature. If data look good, the developers eventually move the therapy into later-stage trials.” Then you have a control group of patients given a placebo. Regardless, when short sellers go on a stampede, it’s best to get out of the way — even if the science is on your side. That’s why Ray set a 25% stop loss — assuring a limited downside on a play that had nearly unlimited upside. Readers were stopped out on Monday afternoon. “I recommend we wait until the short-and-distorters finish their dirty work before we jump back into this very promising company,” Ray wrote. We realize new subscribers to FDA Trader might have a bad taste in their mouths. We know Ray’s solid track record to date matters little to them. We recognize trust must be earned, and that hasn’t happened yet. For those readers, we’ve extended their subscription term by one full year for free. Sony is killing the Betamax tape. In other news, Sony was still making the Betamax tape. Production will cease in March of next year. “This will make the final shipment of all our memory media for Betamax,” Sony said in a Japanese-language statement. It was Sony that introduced a video cassette recorder for the home in 1975. 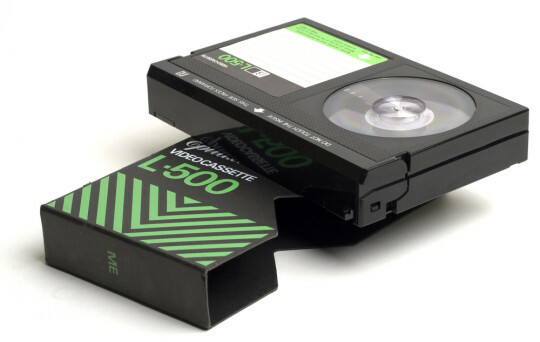 Within a decade, its Betamax format was overtaken by JVC’s competing VHS format. Evidently, people thought it was more important to have six hours of recording time than to have, you know, a halfway decent picture. Heh… Can you tell your editor is still a little miffed about the whole thing? The first VCR I bought in 1987 was a Beta. Even then I recognized I was probably fighting a losing battle. But doggone it, the picture was better! About four years ago, I finally got around to culling my Beta tapes and copied the ones I thought worth saving to DVD. To my surprise, someone wanted my (well-maintained) Beta VCR on eBay for a little less than $100. Probably had the same thought I did but lacked the machine to make it happen. P.S. “It’s the easiest way to make $1,000 extra per month,” our income specialist promises us. But you have to hurry, because a version of this page has been taken down more than once already. To see this amazing (and simple!) moneymaking method, click here before this page disappears again. “Investments don’t get any simpler than selling water in the desert,” Jim Rickards said last week in The 5. And Jim knows of a way to get in on the ground floor. “If everything goes according to plan,” he says, “you could reasonably expect regular average returns of 25% a year when the project is up and running. “Of course, you can’t expect returns like that from ordinary investments. And let me be clear — this is not an ordinary investment. “In fact, for years, the federal government went out of its way to limit opportunities like this. “Luckily for you, that’s all changed thanks to an incredible new law — one that most people have never heard of. It’s called the JOBS Act. And for the first time since the Great Depression, it allows everyday accredited investors to participate in the same types of private equity deals as billionaires. Before Jim tells you how to get in on the action — his top private equity investment recommendation — allow him to lay out the fundamental case. Jim, the floor is yours…. The passage from Coleridge’s classic poem quoted above illustrates the irony of water supply and demand. Water is ubiquitous, yet often scarce when and where we need it the most. We all learn in school that 70% of the Earth’s surface is covered in water. Even that simple fact does not reveal the full extent of the water available, because the surface statistic hides the fact that water runs to great depths — sometimes miles deep. The sheer volume of water on the Earth is hard to comprehend, but it is far greater than the mass of land, including the high plateaus and mountain ranges. Water really is everywhere. Not only is water everywhere, it doesn’t go anywhere. Water can be consumed and channeled, and it evaporates. But eventually, the water makes its way back into vast pools either by runoff or rain. Water changes from liquid to gas or ice and moves continuously, but it does not go to Mars. It stays here on Earth. Yet not a day goes by without a new story on water scarcity, from the recurring droughts in Texas and California to acute shortages in major cities like São Paulo and Cairo. Water wars between upstream and downstream states have already broken out in places like Sudan, India and Pakistan. More conflicts of this type are on the horizon in Turkey, Iraq, Thailand and Vietnam. How can we unlock this conundrum between plentiful water supplies and water scarcity? Most water is salty or brackish, which makes it undrinkable for humans. Even fresh water can be polluted and dangerous to drink without treatment. Above all, water is in the wrong places. There is enough water in the Great Lakes to flood the drought-stricken state of California to a considerable depth, but there is no practical way to move the water from Michigan to California. All of these problems — salt, pollution and distance — point to infrastructure solutions of various kinds. Salt water can be converted to fresh water through the use of massive desalination plants built by General Electric (NYSE:GE) and other companies. These plants are not a perfect solution. They remove salt, but other elements, including trace metals such as copper and magnesium, are left behind in unhealthy quantities. The salt that is removed from the water is returned to the source, thereby increasing its salinity, which can be harmful to aquatic life. Finally, the desalination process is massively energy intensive, so the plants are expensive to run and have a large carbon footprint. But the technology does produce fresh water for industrial use, irrigation and watering golf courses in places like Dubai. Pollution can be removed with the right infrastructure. Some new plants even treat raw sewage to the point where safe drinking water can be produced. Most of us probably still prefer a chilled bottle of Evian to the output from a sewage plant, but it’s nice to know the technology exists. The greatest infrastructure challenge is moving water from Point A to point B. This is partly because water is so heavy, much heavier by volume than oil and other wet commodities that are transported around the world. The quantity of water that would fit under a small dining room table weighs well over a ton. The oil industry has had over 155 years, since the first commercially successful oil well was drilled in Titusville, Pennsylvania, in 1859, to create the infrastructure of wells, pipelines, vessels, refineries and trucks that get oil from distant jungles and deserts to your gas tank. Nothing comparable exists in the world of water, although many of the logistical challenges are similar. The impediments to solving these infrastructure challenges are mainly political. Water is often coveted at the source. Political jurisdictions that have dense networks of lakes, aquifers or upstream rivers are reluctant to share the water with distant or downstream jurisdictions and do so only under legislative or treaty arrangements that put strict quotas on how much water can be allocated to each participant in the arrangement. Even worse, politicians cannot resist the urge to subsidize the price of water for their local constituents. Low prices are maintained by local politicians even though more distant locations might be willing to pay much higher prices for the water. This results in water waste in the source jurisdiction and scarcity in the more distant jurisdiction. Market forces that would tend to distribute water to the highest bidder and best use are squashed, with the result that water is squandered by those paying too low a price. The problems of political interference in water pricing don’t end with waste. Nontransparent pricing also stands in the way of infrastructure finance. Lenders cannot be expected to provide the billions of dollars needed for major pumping and pipeline systems if a market price for water cannot be assured. Subsidized water pricing also works against access to supplies in other ways. Subsidies at the source prevent water from leaving a particular jurisdiction. But even when fresh water is available at a free market price at the source, it cannot profitably be shipped if water is subsidized in the target market. For example, fresh water can be freely owned and sold from sources in Chile, Iceland and few other countries around the world. In principle, this water could be pumped onto clean-hulled supertankers and transported to locations such as Shanghai and Dubai that desperately need imported clean water for drinking. The problem is that Shanghai and Dubai both subsidize fresh water by selling energy to local desalination plants at below-market prices. As a result, Chilean or Icelandic water cannot be sold profitably in those markets once the costs of transport are taken into account. If the subsidies in Shanghai and Dubai were removed, then the imported water could be competitively priced. This raises the question, what is the world price of water? Water is one of the simplest and most homogenous commodities. Water is just H20, a very simple molecule, much simpler than oil or certain mineral ores that trade as commodities. But there is no global price for water. Water does not trade like a global commodity. Water pricing is local, political, regulated, opaque and inefficient. The simplest commodity in the world has the most Byzantine pricing. This opaque pricing stands in the way of the technology, infrastructure and transportation solutions that hold the key to eliminating water shortages once and for all. Fortunately, this untenable state of affairs is rapidly changing, as it must if the world is to avoid the water riots and water wars sure to emerge from the droughts and shortages that are already here. Demand for water is inelastic as to price; people need water to live and will pay any price to get it. Water is super-abundant for all practical purposes. The only thing standing between inelastic demand and unlimited supply is infrastructure. This puts water utilities in the enviable position of being able to intermediate expanding demand and new sources of supply. Utilities serve the same function with regard to water as banks do with money. Just as banks take money from depositors and convert it to loans for borrowers, utilities provide water that they obtain from “deposits” in rivers, lakes and aquifers to needy users. Water supply is closely linked to money flows because finance is the key to large water infrastructure projects. Water supply is also closely linked to energy because most large water infrastructure projects are energy intensive either as to inputs, such as desalination, or outputs, such as hydroelectric facilities. This Water+Energy+Money nexus is the most important emergent property in today’s complex, dynamic world. For most investors, selected water utilities, water infrastructure firms and water finance specialists may have the most to gain in this thirsty world. But for you, there’s a very special opportunity that you have the opportunity to learn about. For the first time ever, I’m sharing my No. 1 private deal recommendation with you. Until recently, I was prevented by law from doing so. But not anymore. Click here to see what my No. 1 recommendation is… and how you can take advantage of this opportunity. P.S. This is a unique opportunity that I can recommend to only fewer than 1% of you. I’ve never made an investment recommendation like it in any of my newsletters. And I’m only doing so right now on a first-come, first-served basis. Click here before access to this opportunity is closed.